We love you, and are glad you've stopped by! Our heart is helping people thrive and flourish in their lives, body soul & spirit with a focus on the spirtual. We still speak churchy language, but we are real people who support and encourage you to think critically, be yourself, be real and stay free to come and go as you please. There's a lot out there offering itself as Christian, but if you got everyone in the same room telling you "the right way" and you tried to add up all the rules and implications of following their version or vision for you, there would be very little -- if any -- agreement. This means that you ultimately have to learn over time about the love of God and how you want to live in response to that throughout your life. God gave you a brain, and you are licensed and ordained to use it. We work with and support those who want to remain faith based while recovering from abuse in religious circumstances and who also are sorting through religious belief related issues in an effort to retain their faith. We love and believe in God, and we also know that there are many places that say the same, but not everyone does what they claim. This site is also something you can visit without having to engage with us, be marketed at or buy something. That's not to say every opinion shared here is objective or neutral. Real people have real emotions, experiences, thoughts, learning and responses. ​What's truly been from God, we've received freely. and want to share freely. You can subscribe to our newsletter and get mailings, but you don't have to. In fact, we're taking down the donation section on the site. We do still have needs, but you can initiate contact with us if you want to help that way. It's a challenge, a joy, and an opportunity to learn about the love of God and God's creation, and to help people sort out the differences between experiences with crazy religion and not-so-nice people from who God really is, separate from the counterfeits. It is right for you to want to sort through what you believe and why in an encouraging environment*. That being said, it is possible to have a solid faith in God, ethics and morals that respect and honor God others and yourself. You can do this without prejudice or pretense. It can be confusing when those who say they represent God are perpetrators of coercion, manipulation, spiritual, psychological, mental, emotional and financial abuse. It is surprising how many people appear to start out strong, build a following or community and then things go awry and it ends up being about money or building a sort of empire. That is not the case of all religious people, but it is way more prevalent that people like to admit. That is why the conversation about this issue needs to happen and why open dialogue in a safe atmosphere is necessary. We are your equals, and we're glad to share the road with you, and perhaps help as you continue to look to Jesus as your source of love, life, purpose and ministry! We are not your "answer," nor do we know it all, but can share what we are learning along the way. We encourage you in what God's leading you to do, in an environment of love, care and respect and honor. Don't let our differences put you off if you have a different background or experience. Although this is a pro-Christ website, those of other faiths can learn much about the signs and effects of religious abuse and gain insight into their own situations. Education is a real help when extricating oneself from coercive control and undue influence and its effects. We welcome those who want to explore this type of life and we don't reject you if you've been hurt by religious abuse or prejudice. This is a good place to explore how your faith and beliefs interact with real life, no matter where or whether you physically go to a building and have church there, too. 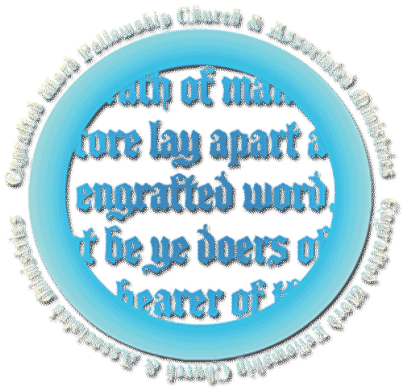 You are welcome to join with us, or join us as part of the larger body of Christ while you participate in other local churches, one on one meetings, or gatherings and activities in the body of Christ, whether that be in person, by phone or through electronic and print media. Please come and go as it fits for you. In fact, we encourage you to fellowship with other people in your geographical area, via in person gatherings, with others who believe Jesus Christ. We believe every human being is of value and worth. It is beneficial to have a broad base of relationships where you can be encouraged and encourage others, each benefitting from the other's experience and knowledge. Please note that the section on Abuse (relationship & spiritual) has been updated and reopened as of 2/01/19. This is located under the"TRAINING" dropdown menu under the "Abuse" submenu. We are transitioning our newsletter, and signup will be available again soon. Please check back for more. God provides healing, and ministry for spirit, soul & body. Our emphasis is on the spiritual, but you can't neglect good sleep and drinking water, eating in a way that is healthy and nourishing to you, and basics of self care and expect to thrive spiritually. We regularly interact with believers of many different denominations and it is our heart to encourage unity without error and without a religious spirit... and this means that you may find something on this site that is "outside of the box", and so we encourage you to research things that challenge you. Not all people saying they're Christian are bigoted, abusive and needing you to say "uncle" to their way of thinking, so don't let bad past experiences have you prejudge the next ones. And it is still okay to have eyes open to people who don't understand boundaries or who don't want you to have the freedom to let your "yes" be yes, and your "no" be no. You're not required to let abusive people box you into obeying them to supposedly "honor God." ​Look to God and His love. Don't sweat the small stuff in terms of stressing about something where someone is not 100% on point. Each of us has something to offer. We are all needed. You are also welcome to roam the site, enjoy, ask questions and connect with us. We hope to be dropping some of our religious language and to be more accessible to you from a place of real love and care. If you are looking to renew your relationship with God, from a Christian perspective, or take time out to reflect upon the gifts of God, the print version titled GIFTS FROM GOD was released a few years ago. There are some things I'd change, but currently working on a new book, so look for the update in late 2019 early 2020. 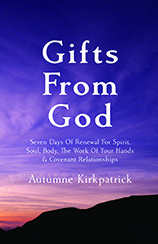 Gifts from God is available in print on Amazon, and the Amazon Kindle, version has also been released. Please check back for more good news. Jesus taught, healed and ministered. We don't just do 'intellectual' teaching here, meaning that most teaching has ministry as that is what Jesus did and told us to do. We see lives changed as people continue with God and remain in relationship with Him.